The nucleus of the UMD CSC team (L-to-R): Jake Schofield, Nels Eide, Landon Richardson, Keith Propson, Mark Boeckmann, Jake Lynch (blue hat) and Brenden Bungert. Of course this comes as no surprise to anyone who knows me, but it’s a fact that I conveniently ignored for many years until the evidence became overwhelming. 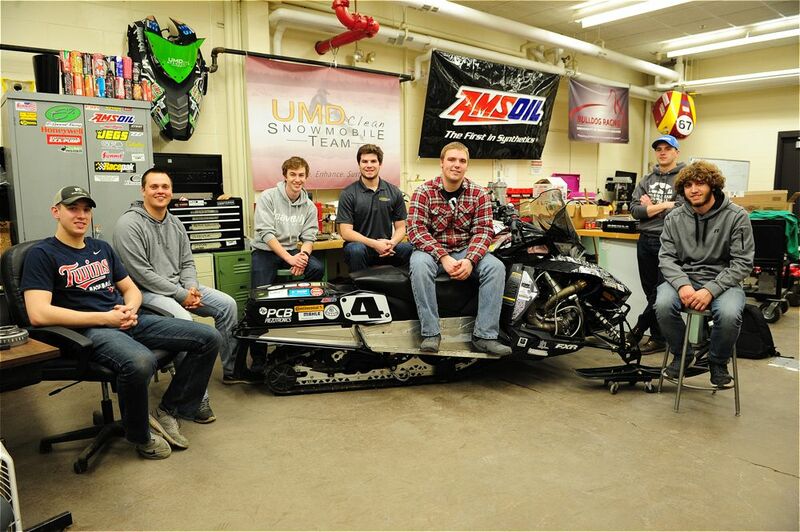 Recent revelations of my dumbassedness came after spending a day with the University of Minnesota Duluth (UMD) Clean Snowmobile Challenge team. This group of 15 smart, resourceful and incredibly hard working young men and one woman are emphatically doing something with their college lives that makes them smarter, experienced in challenges that will fully prepare them for life and connected to a group of friends/colleagues that they’ll remember for the rest of their lives. In other words, they’re pretty much the opposite of a certain dumbass I know whose primary achievements in college were attending 30% of his classes and not getting arrested. Those on the UMD team are seizing the day (and a great opportunity) by throwing their every spare moment of college life into building a snowmobile for the Clean Snowmobile Challenge (CSC) an annual competition administered by the Society of Automotive Engineers (SAE) that challenges college teams/clubs to build snowmobiles utilizing novel solutions to the sound and gaseous emission challenges presented by snowmobiles. According to SAE, the goal of the CSC is to generate new ideas and new technology that can be scaled into industry, as well as to give university students real world teaming experiences and production challenges. In other words, make cleaner snowmobiles that will satisfy sledheads and that could be incorporated into production. 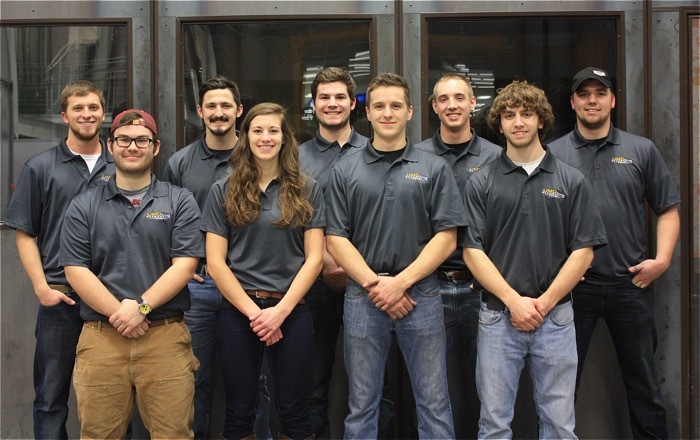 Mission accomplished for the UMD team, which marked it’s sixth year in the CSC when it competed at the 16th Annual event held at the Keweenaw Research Center in Houghton, Mich., this past March. CSC attracts more than 20 teams from across the U.S., Canada and even Finland. It’s massive culmination of judging, testing and competition. The real story here is the effort it took to get there. Starting with an Arctic Cat Pantera 3000, these ambitious students – most of whom were avid snowmobilers prior to joining the UMD team – added a intercooled turbo-charger; incorporated a sophisticated exhaust gas recirculation (EGR) system as well as exhaust catalyst; built their own tunnel-exiting exhaust/muffler; utilized an entirely different engine control unit (ECU); and calibrated the fuel/air mixture so that this machine not only ran, but ran on E85 to 87 octane fuel, saw horsepower jump from 60 to 100, produce only 67 decibels of sound and deliver 20 mpg. But all that’s just the tip of the iceberg. 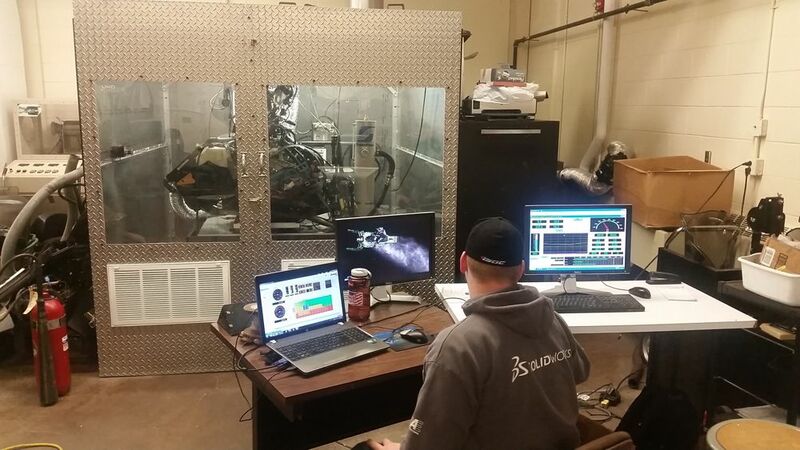 Because the UMD team built their machine with a miniscule $30,000 budget garnered from their own fundraising, without any adult or professor help, using a dyno cell they built themselves. They did it by devoting roughly 70-hours a week per person to the project, ignoring the more pleasurable temptations of college life and by devoting themselves to the project and their commitment to each other. They’re mostly mechanical engineering students, seasoned with one civil engineer and, interestingly, one soon-to-be social studies teacher. 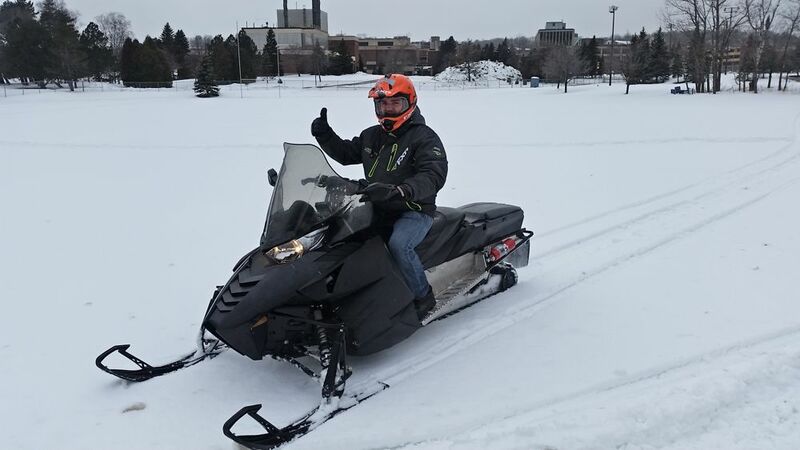 Most learned of the opportunity at the UMD activities fair, where the previous year’s CSC project snowmobile was a beacon of interest for a lot students. The club itself was a primary reason for Boeckmann choosing UMD over other college options. Like his teammates Keith Propsen, Brenden Bungert and Jake Lynch, he wants a job working for an OEM. 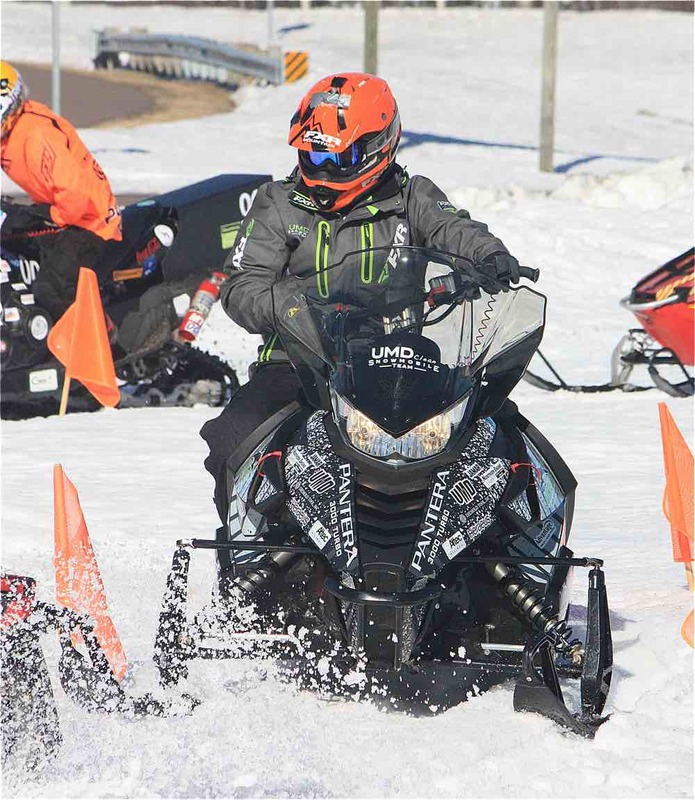 Nearly all of the 15 students were already avid snowmobilers prior to joining the CSC team. Nels Eide (back row, far right in above photo), a true outlier of the group because of his pursuit of a teaching degree, raced cross-country (for Team Arctic!) prior to college. Eide is one of several students on the UMD team who greatly impressed me (and gave me great hope for the future). Knowing my affiliation with Arctic Cat, he contacted me directly to invite me to meet the team. When I accepted the invitation and spent the afternoon with him a few others in their cramped space at UMD, I soon learned that Eide and club president Brenden Bungert handled much of effort to solicit nearly 100 businesses and organization for financial or product aid. Eide handled marketing, media relations and much of the team’s organizational requirements. Smart, articulate and experienced WAY beyond his years, Eide is going to be a phenomenal teacher once he graduates. 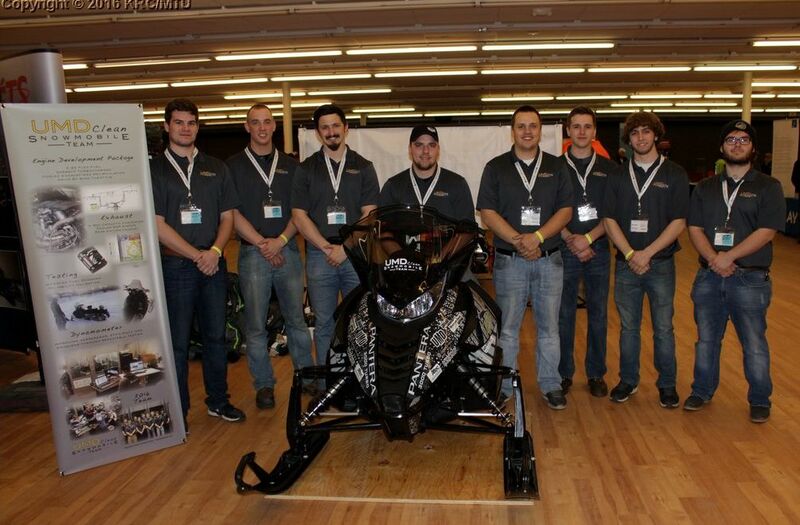 For the 2014 and 2015 CSC, the UMD team utilized an Arctic Cat ZR 7000RR. Naturally aspirated but a very powerful engine in stock trim, it proved difficult to compete with more mildly-tuned, lower-displacement 4-strokes. It garnered a 4th place finish at the 2015 CSC while producing more horsepower than the top-3 finishers combined, but that was part of the problem. 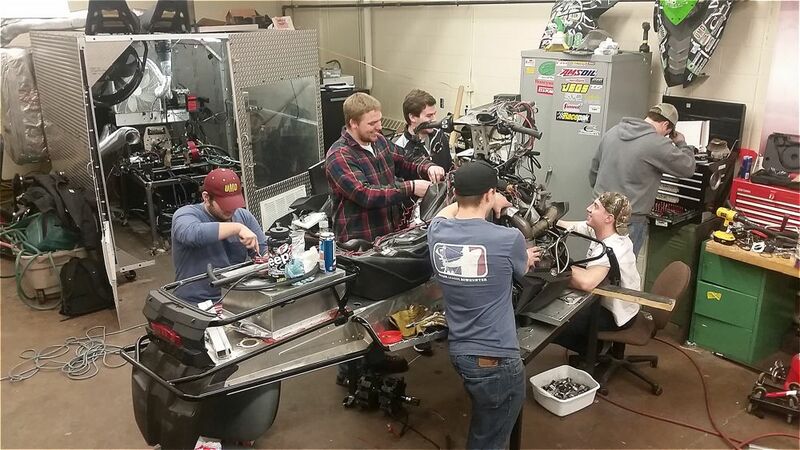 When Arctic Cat unveiled its 700cc 3000-Series 4-stroke engine late in the winter of 2015, the UMD crew knew it would be the perfect platform to build their 2016 CSC entry. 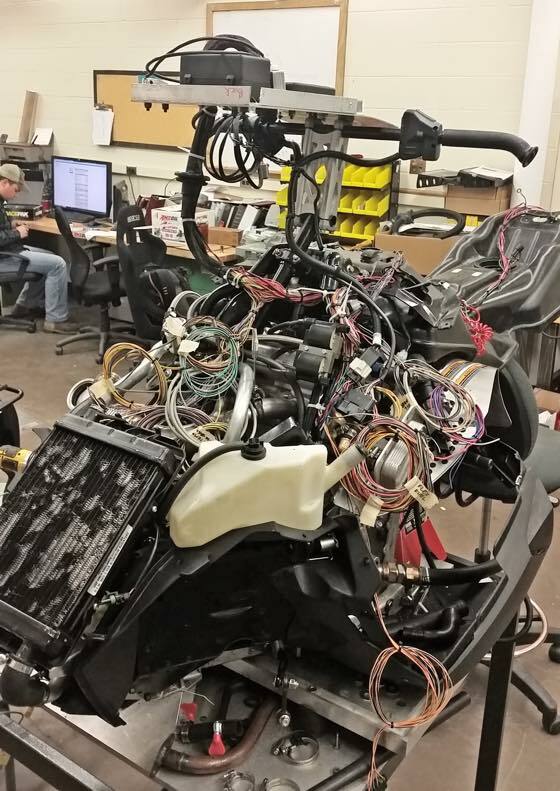 They received the 2016 Pantera 3000 in May 2015 and immediately started working on it, including during the summer. There was engine modeling software to develop, plus the EGR system and revised exhaust system to incorporate. Boekmann and Bungert worked untold hours on the engine package, spearheading the most ambitious elements. There was testing on the dyno as well as on grass. There was welding and machining. There was fundraising... a seemingly endless number of attempts to solicit money and/or products. And there were hundreds of trips to junkyards, hardware stores and the like. “Most teams just do one big add-on like those. A few teams do a couple. We did three,” laughed Boekmann. You could call them a rag-tag group of over-achievers punching above their weight against bigger and better funded teams, and you would be correct. It would be easy to feel a bit sorry for their apparent underdog status were it not for the fact that this team was rich in lessons learned. Be resourceful, creative and rely on your own skills? Check, check and check! 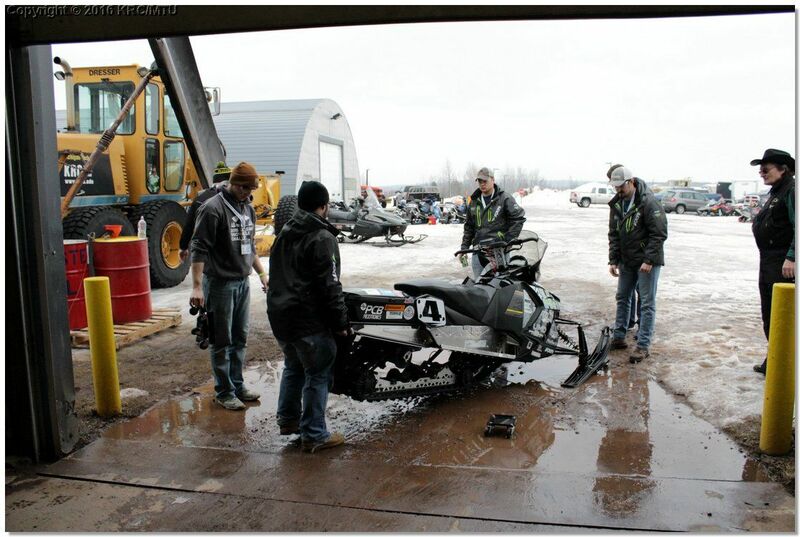 With a flurry of final work that completed their project, the team headed to Keweenaw Research Center pulling Eide’s old gooseneck race trailer stuffed with the sled, parts, tools and gear. Ample pre-event testing, including laps on the UMD rugby field (above), showed plenty of promise for the ambitious project. It delivered 100 hp on the dyno, 20 mpg with 87-octane fuel and 16 mpg on E85. It showed an 81-percent reduction in emissions and was even quieter than the stock engine package. It ran 200 trouble-free miles and over 150 hours. Everything was going according to plan. A top finishing place looked decidedly possible. The night before the competition began, while attempting the mundane task of charging the battery, the positive lead was mistakenly placed on the negative terminal. And in an instant the ECU was blown. Another ECU was overnighted to the crew, but it wouldn’t arrive in time for the CSC Endurance competition, one of the hallmarks of the event. UMD would go on to win the Best Engine Design Award, a hefty accolade no doubt and a testament to the ideas Boeckmann and Bungert brought and the work everyone gave the sled, but they were effectively unable to compete for the overall title. 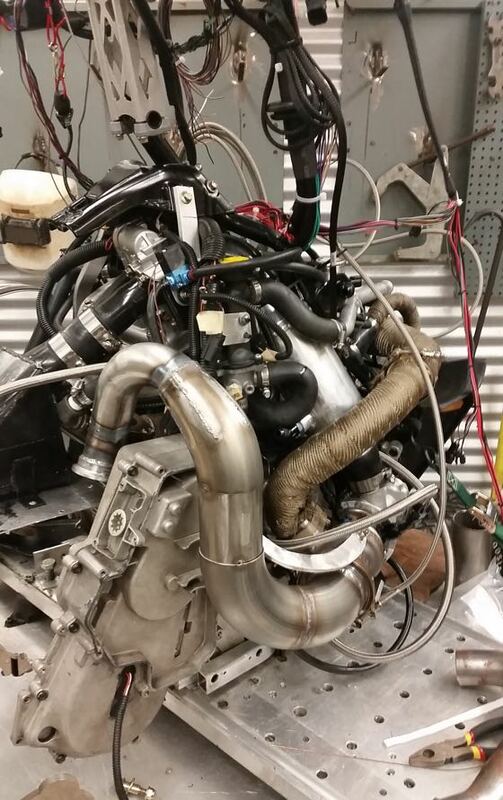 The good news for the UMD team is that their engine and exhaust package will be incorporated into their 2017 entry, which they’re hoping will be placed in the new ZR chassis configuration rather than the longer-track Pantera. Either way, they’re a looooong way towards completing the machine thanks to the gargantuan effort they produced this last season. There will be more fund raising. There have been presentations to give, including one for Arctic Cat engineering back in May. There will be new members joining the club. There are summer internships at OEMs. There are careers being jump-started. In the handful of hours I spent with the nucleus of this team, I was truly in awe of their determination, work ethic, ingenuity and can-do attitude. To all the drum beating about how this generation isn’t as gritty as prior generations, I hold up these students in sharp contrast. They are truly outstanding individuals who came together as an even greater team. 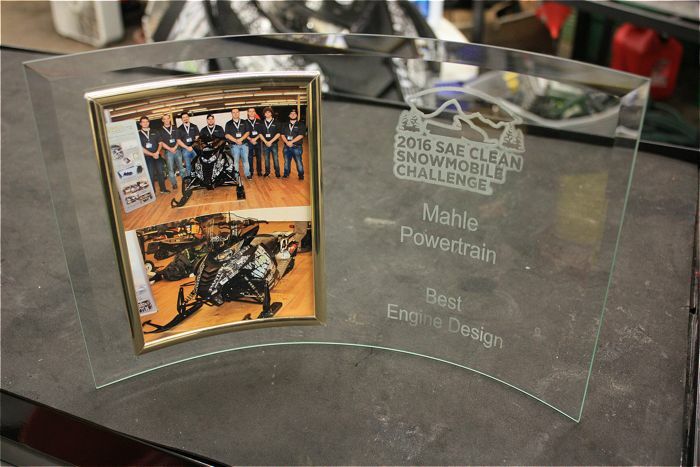 Exciting things will come in the future thanks to a program like the Clean Snowmobile Challenge and ALL the teams and individuals who participate. 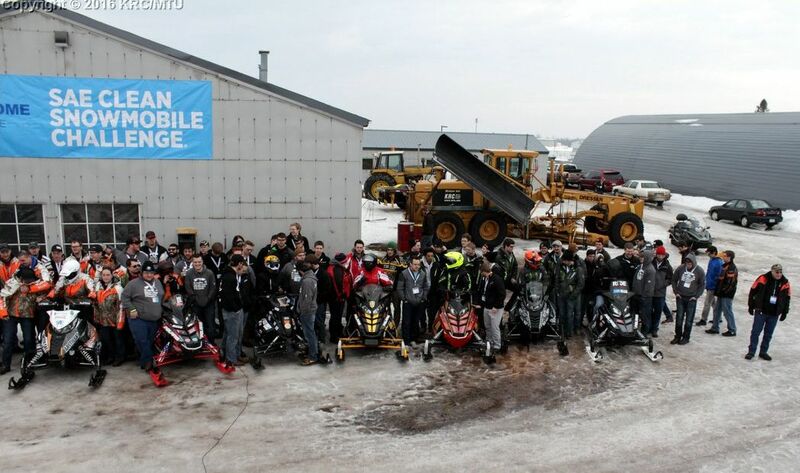 These men and women will design our future snowmobiles, ATV/UTVs, motorcycles, trucks and other cools stuff. And they’ll make dumbasses like me grateful for all of it. Thanks to all the CSC teams, and to the UMD team for inviting me into their world. Another great read John. It's good to see some of the next generation with some fire in their belly. Did you get any pictures under the hood or is that classified. John, is Nels any relation to Don Eide ? Swell write up as always John! Only a true wordsmith can use "dumbassedness" in a sentence and carry it off. Kudos to the young people on their hard work and innovation. Well done! Very well done guys! Thanks for a great write-up John! Now drop that thing down, get some Woody's 45 deg's, bring that thing to Pine Lake and put Nels on trigger! 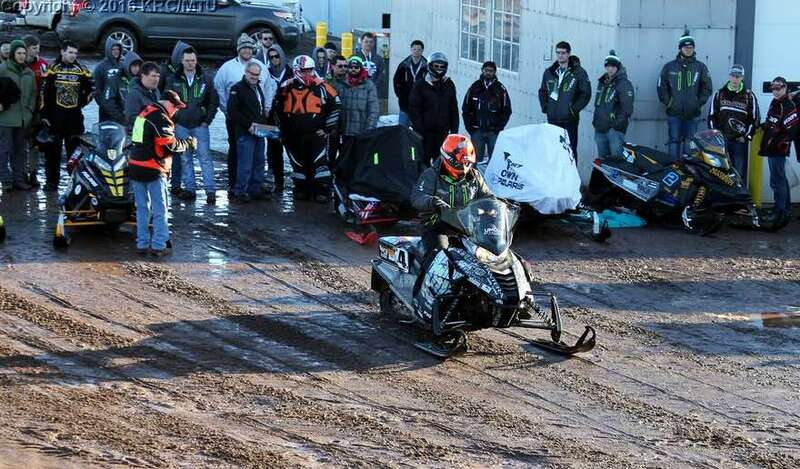 Great read, as a former clean snowmobile challenge competitor and team manager I know all too much about the struggles the team faced. Competing alongside them as been a pleasure and everyone is always a great sport as teams want to see not only themselves succeed but the everyone else as well. Definitely one of the greatest things I've ever been involved in and I look forward to going back to the UP this year to spectate. I do want to mention though as one of the other teams competing that we also did not have a 5th wheel trailer, we'd load up a rented Penske truck and a couple personal vehicles before tackling the 20 hour drive.